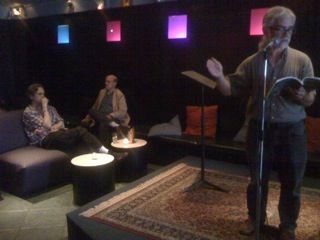 This Lynchian photograph was taken by Kat Georges from somewhere in the studio audience at the book launch last night. I had a wonderful time with a wonderful turnout. There was solid representation from the New York poetry scene, metrical and non-, along with many friends from journalism, college, garage bands, and previous communal arrangements up and down the State of New Jersey. There was a serious Boston Red Sox fan in the house, and George Witte did me a solid at the mic. Thanks to all who attended. This entry was posted on July 9, 2010 at 8:47 pm and is filed under Readings. You can follow any responses to this entry through the RSS 2.0 feed. You can leave a response, or trackback from your own site.